As I mentioned in my first ever post dying is an expensive business. These days in the UK dying costs an average of £7600 and it’s still rising. This is obviously a huge problem. It’s a sad reality in the UK that the death of a family member can often send families (especially those on low incomes) spiralling into debt. People often feel pressured to put on lavish funerals and feel that seeking low-cost alternatives is somehow disrespectful to the person who has died. And then there’s that huge, heavy word……tradition. There are many ways to help reduce the cost of funerals and I’ll be talking about them all on this blog. In this post I’ll be sharing some more general advice and information about cost saving measures and available funding. It’s important to know that there is support out there if you are struggling to afford funeral costs and that you are not alone! 1. Talk about it now. Discussing your funeral wishes with friends and family will provide clear plans and can save unnecessary costs. 2. Slow down, take a breath. Don’t feel rushed into making funeral arrangements when someone dies. Take time to make the right decisions. 3. Shop around. Costs vary between funeral directors. Get three itemised quotes – you could save a lot of money. 4. Ask about a ‘simple funeral’. Most funeral directors belong to trade association and should provide a ‘simple funeral’ package. 5. Are you eligible for help? Call the DWP bereavement line on 0845 6060265, or the Citizens Advice Bureau, to check if you are eligible for financial support. 6. It’s your choice. There are few essentials to a funeral – cars, flowers, even a paid minister or celebrant – are optional. You even don’t need to hire a funeral director. 7. Cremation or burial? It is a personal choice, but it’s worth noting a burial is often more expensive than a cremation. 8. Make it meaningful. At a funeral, people remember thought and goodwill rather than lavish expense. 9. Consider credit carefully. Will your funeral director negotiate a payment plan? Be clear about terms, conditions and final costs. 10. If no one can pay? Ask about a simple and dignified hospital or council funeral. It could be useful to print this out for someone organising a funeral. Unbeknown to a lot of people there is actually some funding available to help cover funeral costs if you are finding it difficult. The Social Fund and Funeral Payments are available to people who are in receipt of certain benefits and can help with the incurred cost of a funeral. If you think you may be entitled to this help you can contact the Bereavement Service helpline on 0345 606 0265. They will be able to advise you on all the benefits available to you. 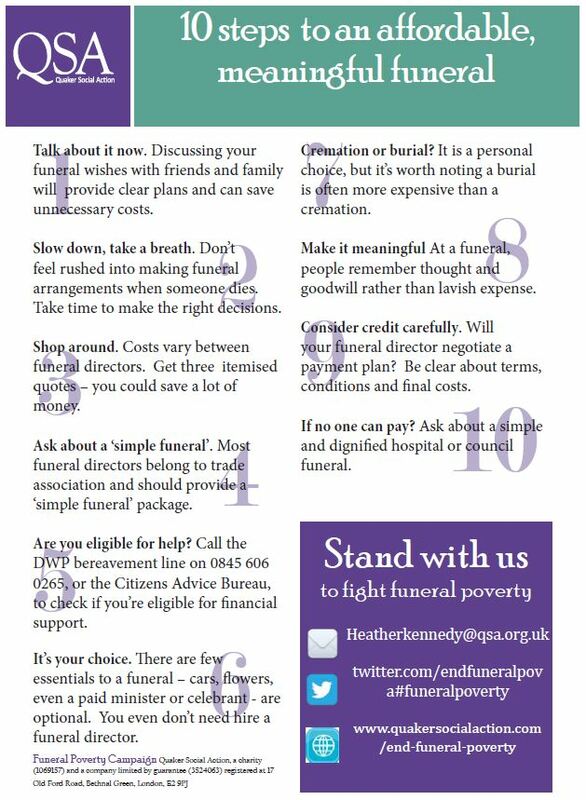 The excellent Natural Death Centre has some great advice for keeping funeral costs manageable. In fact the Natural Death Centre has some brilliant advice about all aspects of dying and funerals. I would highly recommend taking some time to look through their site. The resources listed above are a good place to start to help avoid funeral debt. I will be sharing more tips and resources as this blog continues. I think the most important thing to remember is to talk openly with your family about your funeral plans. Let them know what you want and what you don’t want and tell them if you don’t want them to spend thousands of pounds on it. If you let your loved ones know your feelings ahead of time then they will feel no guilt opting for lower cost alternatives when the time comes. Funeral debt is unnecessary and destructive. 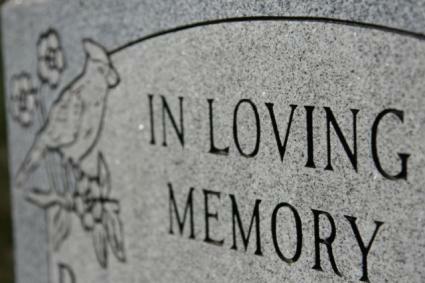 The only thing our families and friends should be left with after our funerals are warm loving memories. An excellent and informative article, thank you. It is a great pity that in this country, people are conditioned never to mention death, dying or your own wishes for funeral arrangements. When some people have passed away, you may then find their wishes in their wills or a letter but mostly people don’t discuss what they want. It really is about time this changed in my opinion. Its not morbid – death is a fact of life. It is going to happen to each and every one of us, like it or not.